Apparently, tassels have a long and storied history. 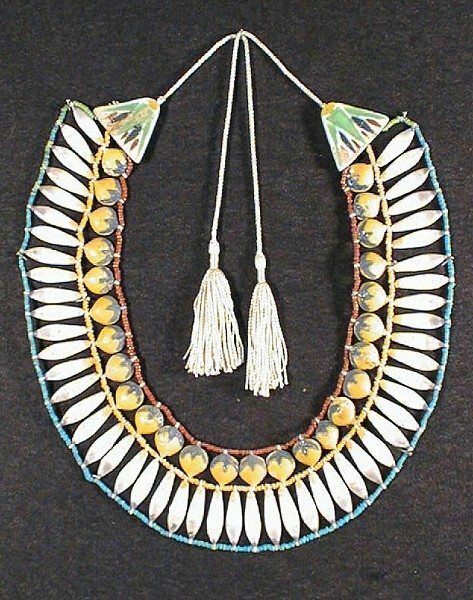 Stout Brothers, a 90-year-old company that makes tassels and other trimmings for the home, has a fascinating history of tassels on its site, illustrating a necklace incorporating tassels reportedly made during the 18th Dynasty and found in Tutankhamun’s tomb in the Valley of Kings in Egypt. My, tassels have managed to make the transitions through centuries quite nicely! 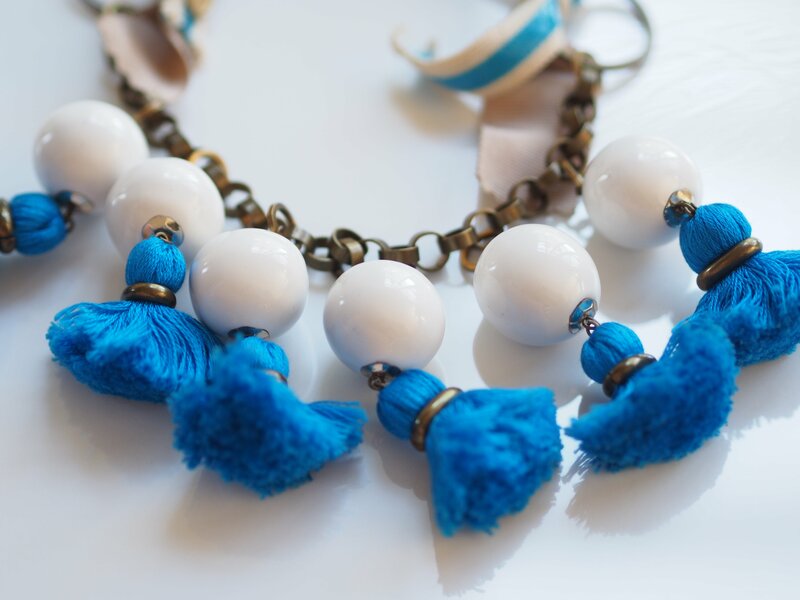 Another of my favorites is my Les Précieuses white bead and vibrant blue tassel on a grosgrain ribbon necklace. I bought it in Brussels, Belgium, at the Les Précieuses shop there. I discovered the brand in Paris, where I was living, and wanted to go to one of the brand’s own stores (vs. at a department store, as in Paris). I remember having a problem finding the boutique in Brussels, though. Our first try was a bust. We hiked northeast of the famous town square (Grand Place) to a neighborhood known as Sainte Catherine, only to find a swanky home furnishings store (a bit too swanky for our student budgets). Apparently, the internet site I checked hadn’t been updated. So we trekked to the other side of town (Châtelain) and found the one and only Les Précieuses boutique. I bought my tassel necklace (which was on sale – score!!). 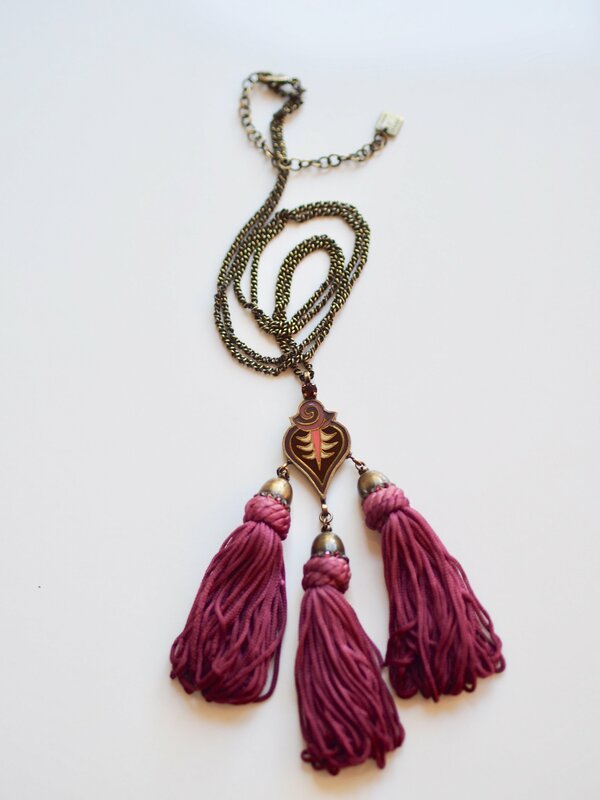 My Konplott necklace I especially like because of the rich, dusty pink tassel. I discovered Konplott after moving to Germany in 2013. Discovering a new brand is always such a thrill and I was very excited to find the Konplott boutique in Hamburg during one of my first days exploring the city. I found it tucked among little shops, some of which were smaller European brands I’d never heard of, in Hamburg’s upscale downtown area in the Hanseviertel. Konplott wasn’t sold in the U.S. at that point, and had only a couple of boutiques in Germany. It’s fascinating to see how far the brand has expanded in just a few years – not only is there a U.S. online boutique, but Hollywood actresses (or at least Bravo reality TV stars) are now wearing the jewelry! Any follower of this blog knows (or will come to know) Césarée Paris, one of my favorite brands in the entire world. As you might imagine, Césarée is located in Paris, in a Saint-Germain-des-Près backstreet. I love the wild, exotic style of the jewelry, but also the fact that the pieces are made right there in the shop! The shop is tiny, maybe 150 square feet, and you can watch women actually hand making the pieces while you browse. Perhaps the queen of tassels is Mercedes Salazar. I mean, literally. 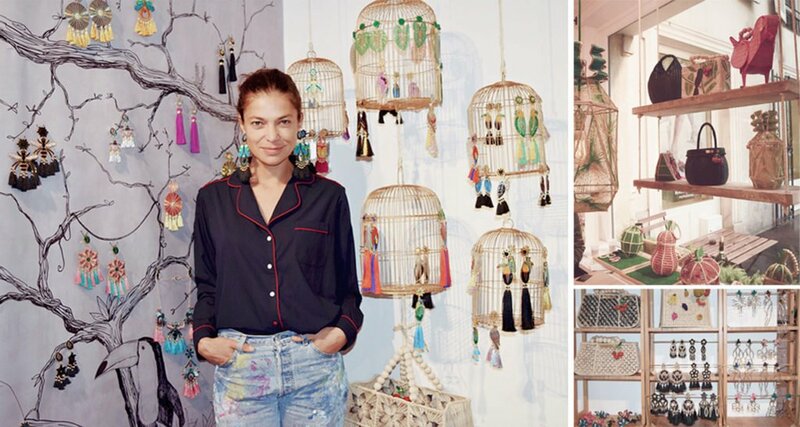 She hosted a pop-up store in Paris last fall resplendent with tassels. It looked like a tassel bazaar to me (at least from the photos..)! I especially love her earrings – both the Art Nouveau chandelier styles and the animal styles. Beyond my collection, I found another pair of earrings that I love – partly because they have tassels and partly because they’re pink and purple! 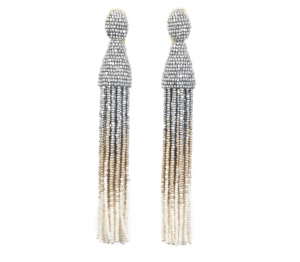 This pair from Katerina Makriyianni is right up my alley! 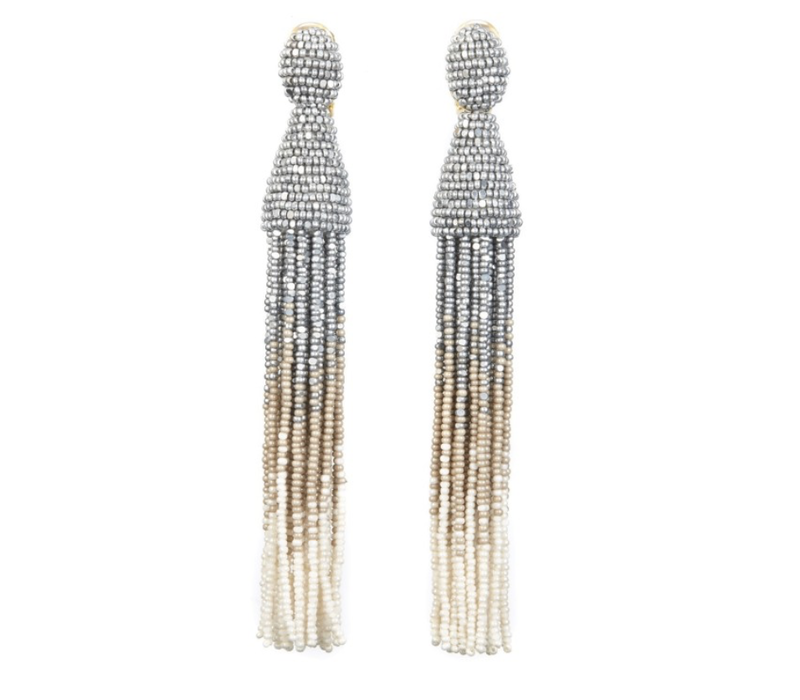 And I couldn’t resist highlighting Oscar de la Renta’s ombré beaded tassel earrings. 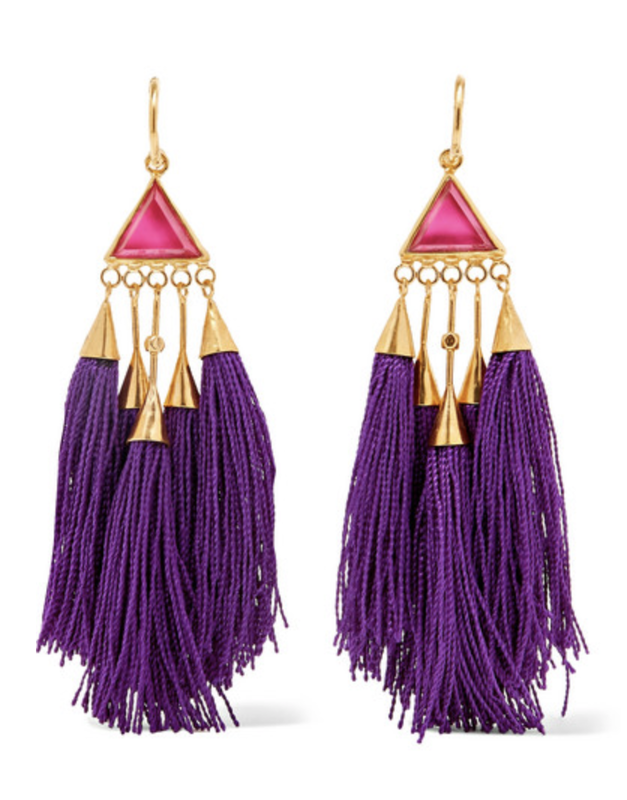 Honestly, everywhere I look, from Target to Saks, I see tassels. And all I can say is “hooray!” But even when tassels are no longer in style, I will still be sporting them. It’s just nice to enjoy the vast selection, for now. Oh, and now that I’ve had my website redesigned, I’m making a commitment to blog more. Promise!